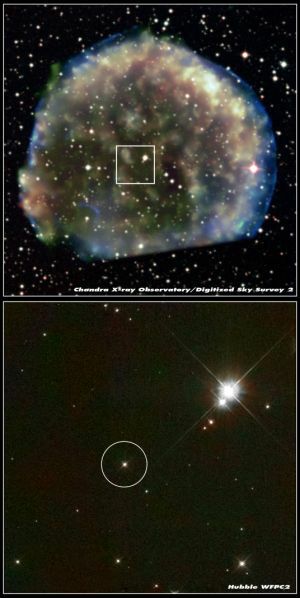 Researchers of an international collaboration including the Max Planck Institute for Astrophysics have found for the first time evidence that Type Ia supernovae occur in binary systems where a white dwarf explodes while the companion star survives the explosion. The result comes from a survey in the region of Tycho Brahe's supernova, an explosion that took place in our Galaxy in 1572 A.D. The identified companion star is similar in luminosity and color to our Sun, and has triggered the explosion of the white dwarf by donating enough mass to it. Fig. 1: The star labeled Tycho G inside the supernova remnant. Fig. 2: Upper image: Image from the Auxiliary Port at the William Herschel Telescope. It shows again the relative emptiness of the field of observation. The search area covers a radius of 0.65 arcmin around R.A.=00h 25min 19.9s, Dec.= +64o 08' 18.2" (J2000), geometrical centre of X-ray emission of the Tycho supernova remnant as determined by the Chandra satellite (Fig. 1). Repeated photometric and spectroscopic observations of the visible stars were done to check for possible variability and to exclude that they are binaries. 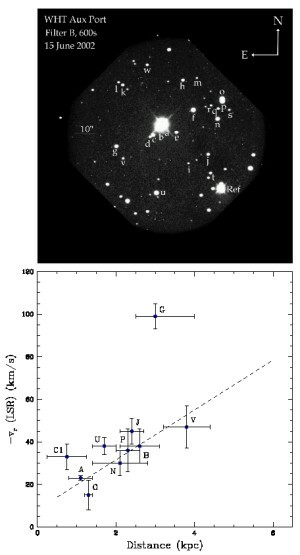 Lower image: Radial velocities (measured in the local standard of rest, LSR) versus distance for the subsample of stars closer than 6.5 kpc; the other stars are at distances well beyond the supernova remnant. The candidate star for the companion of Tycho's supernova, Tycho G, has a velocity three times higher than the mean velocity of the other stars at that distance. Fig. 3: Spectra of Tycho G showing that it is a subgiant not belonging to the stellar populations of the halo or thick disk of the Milky Way. Right: Several fits to the atomic lines of iron (Fe) and nickel (Ni) in the spectra of Tycho G, assuming abundances as in the Sun (red; bold), abundances 30% of the solar one (blue; dashed) and 10% of the solar value (green; dotted line). Left: Low resolution spectra also classifying Tycho G as a subgiant of spectral type GO--G2 and solar metallicity. Type Ia supernovae are very important stellar phenomena. They are the most homogenous type of explosions in the Universe, and they are so bright that they are visible billions of light years away. They have led to the important discovery of the accelerated expansion of the Universe, unveiling the presence of a new form of energy driving the expansion. Despite their importance, little was known about the systems producing those explosions. It is known that a Type Ia supernova occurs when a carbon--oxygen white dwarf grows in mass by the accretion of matter from a stellar companion reaching the critical conditions in its interior that lead to thermonuclear runaway. Though the exploding star is identified as a white dwarf, many possibilities have been theoretically suggested for the companion, the triggerer of the explosion. Unless the companion star is another white dwarf, in which case it should be destroyed by the mass-transfer process itself, this companion star should survive and show distinguishing properties, being at the distance of the supernova and moving with a peculiar velocity as a result of the disruption of the orbital system in the explosion. Tycho Brahe's supernova --- the Type Ia supernova observed by Tycho Brahe and other astronomers in 1572 --- offered a unique opportunity to observationally address the identification of the surviving companion of this type of stellar explosions. This task was carried out by an international collaboration of researchers, led by Pilar Ruiz-Lapuente of the Max Planck Institute for Astrophysics and the University of Barcelona. In a big survey the astronomers gathered complete information of the stars in the gaseous remnant of Tycho Brahe's supernova, and classified them in spectral type, luminosity class, metal content, distance, radial velocity and proper motion on the sky. Several years have been spent to obtain the information on those stars, through the use of the telescopes of the European Northern Observatory in La Palma, the W. M. Keck Telecopes on Mauna Kea and the NASA/ESA Hubble Space Telescope. As a result of this survey and its evaluation, the astronomers could exclude as viable progenitors of this Type Ia supernova a long list of candidates proposed before: Systems in which the companion star donating gas to the exploding star is a red giant star, a red supergiant, a subdwarf. Instead, a high-velocity subgiant star close to the center of the remnant, similar to our Sun in luminosity and color but slightly more evolved, is found to be the likely surviving companion, the donor of matter that triggered the explosion. The star, named Tycho G, is at the distance of the supernova remnant and moves at more than three times the mean velocity of the stars at that distance (Figure 1). Identifying the progenitors of Type Ia supernovae explosions is crucial task as it establishes the initial conditions of the explosion and helps understanding the factors that can affect their luminosity. This is of high importance when Type Ia supernovae are used as standard candles for measuring distances in the universe. The velocities of all the stars near the center of the supernova remnant were measured both in the direction of our line of sight by measuring the Doppler shift of the lines in the spectrum of the stars, and tangentially, across the sky, with the use of the Wide Field Planetary Camera 2 on board of the Hubble Space Telescope by taking images four years apart. "Both radial and tangential velocities of Tycho G are a factor three larger than the mean velocity of stars at that location", Pilar Ruiz-Lapuente reports (Figure 2). The metallicities of the stars, i.e. the enrichment of their gas with elements other than hydrogen and helium, was also determined to exclude that this star belongs to the stellar populations of the halo or thick disk of the Milky Way. Those stars move also with high velocities, but they have much lower metallicities than stars of the galactic plane. "Although the region where Tycho Brahe's supernova exploded is very deprived of such stars it was suspected that Tycho G could still be a fast halo star", Pilar Ruiz-Lapuente says. "However, the high content of nickel and iron in the gas of Tycho G clearly identifies it as a star born in the galactic plane" (Figure 3). The space velocity of Tycho G is 136 km s-1. Such a peculiar velocity agrees with those expected from the disruption of a binary system consisting of a white dwarf and a subgiant or main-sequence star with roughly a solar mass --- a system that has resembled the recurrent nova U Scorpii. This discovery connects Type Ia supernova explosions to `cataclysmic variable phenomena', i.e. binary stars which exchange mass, and ties a loose end in stellar evolution. Pilar Ruiz-Lapuente (Max-Planck Institut for Astrophysik and Univ. Barcelona), Principal Investigator of the survey for the progenitor of Tycho Brahe's supernova.